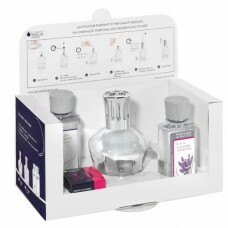 Essentials - Round Gift and Starter Pack by Lampe Berger USA. A combination of purity and simplicity. This box includes a BASIC catalytic burner, a funnel, 180ml of So Neutral, 180ml of Ocean Breeze and one round Essential lamp.